Like the flashing lights and sounds of clinking coins at a casino, buying stocks on margin is one of those things that might appear on the surface to be a great way to make money. 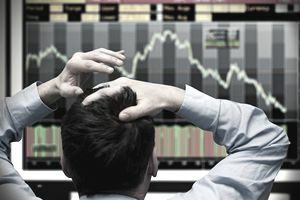 The pitch usually goes something this, "If you have a few thousand dollars in your brokerage account, you might qualify to borrow money against your existing stocks at a low-interest rate to buy even more stock, leveraging your returns!" The reality is that trading on margin is an inherently speculative strategy that can transform even the safest blue chip into a risky gamble. It allows people and institutions desiring to get really aggressive to buy more shares of a company than they could otherwise afford. When things go south, it can get really ugly, really fast, even leading to personal or corporate bankruptcy. In the past, I've used some real-life case studies to demonstrate how terrible the consequences of buying stocks on margin can be. One man, Joe Campbell, woke up to find himself $106,445.56 in debt to his stockbroker due to a margin position that went against him. Many, many other individuals lost everything when they swung for the fences, some using margin debt, buying more shares than they could afford of a company called GT Advanced Technologies, which went bankrupt. Entire retirement accounts were wiped out and some investors talked about contemplating suicide. To top it off, if you open a margin account, rather than a so-called cash account, you introduce something called rehypothecation risk. If the financial world ever falls apart, again, which it inevitably will, you might not realize that you've exposed far more of your assets than you knew to losses that aren't even yours. There is simply no reason to go through life like this. I feel so strongly about it that one of the first things I did when sitting down and planning the global asset management group my family is launching was to include it in a list of policies for our private accounts. Kennon-Green & Co. only manages money in cash accounts as margin debt is neither welcome nor necessary except in a handful of extremely limited cases such as structured risk arbitrage transactions, which certainly is not appropriate for new investors self-educating to run their own portfolio. I don't care if it could generate higher fees for the firm. I don't care if a client wants it. That's not what we do. This might seem to be a bit old-fashioned but there are certain risks that I believe are imprudent. Margin is one of them. With all of that said, if you still aren't deterred about margin, and you want to employ margin debt in your own portfolio, keep reading. In the rest of the article, I'll explain some of the basics of how it works to provide what, I hope, is a better understanding of the mechanics involved. In the most basic definition, trading on margin is essentially investing with borrowed money. Typically how it works is that your brokerage house borrows money at rock-bottom rates then turns around and lends it to you at slightly higher (though still objectively cheap) rates, floating you funds to buy more stocks - or whatever other eligible securities you desire - than your cash alone would permit you to buy. Or, I suppose, if you're really going for speculation, sell short. All of the assets in your account, as well as your personal guarantee, are held as assurance that you will repay the debt no matter what happens in the trading account itself. Even if the account blows up, you are on the hook for the money immediately. No payment plan. No negotiating terms. If you don't pay, the broker can haul you into court to start getting judgments to seize your other holdings, ultimately requiring you to throw yourself at the mercy of a bankruptcy judge. Meanwhile, as your credit score plummets, you might find everything tied to your credit rating getting destroyed, too. Your insurance rates could skyrocket. Your other lenders could restrict access to borrowing capacity, leaving you no ability to pay your bills. Utility and phone companies may demand cash security deposits. Potential employers may look at your credit and decide not to hire you. All because you were impatient to make money, not satisfied to compound prudently over time, collecting dividends, interest, and rents along the way. These days, getting access to margin capability couldn't be easier. Brokerage houses make a lot of money both in trade executions and interest income as a result of customers trading on margin. To open a margin account, all you have to do is indicate you want it on the initial account opening form (sometimes, you have to opt out!). If you already have an account, all you have to do is fill out a short addendum agreement. That's it. The brokerage house may run your credit. Otherwise, eligible individuals, institutions, and other legal entities are given the power to borrow money from within their account. You can even write checks against your holdings and make withdrawals, the margin debt covering the draft. Each brokerage house establishes a margin maintenance requirement. This maintenance requirement is the percentage equity the investor must keep in his portfolio at all times. For example, a house that maintains a 30% maintenance requirement would lend up to $2.33 for every $1.00 an investor had deposited in his account, giving him $3.33 of assets with which to invest. An investor with only one or two stocks in his portfolio may be subject to a higher maintenance requirement, typically 50%, because the broker believes the probability of not getting paid is greater due to the lack of diversification. Some assets, such as penny stocks, aren't eligible for margin trading at all. Frankly, this is wise. Investing in penny stock is almost always a bad idea, anyway. Adding leverage on top of it would be deranged. A speculator deposits $10,020 into his margin-approved brokerage account. The firm has a 50% maintenance requirement and is currently charging 8% interest on loans under $50,000. The speculator decides to purchase stock in a company. Normally, he would be limited to the $10,020 cash he has at his disposal. However, by employing margin debt, he borrows just under the maximum amount allowable ($10,000 in this case), giving him a grand total of $20,020 to invest. He pays a $20 brokerage commission and uses the $20,000 ($10,000 his money, $10,000 borrowed money) to buy 1,332 shares of the company at $15 each. The stock falls to $10 per share. The portfolio now has a market value of $13,320 ($10 per share x 1,332 shares), $10,000 of that is cash from the margin loan, $3,320, or 25% of the margin loan, is the investor's equity. This is a serious problem. The speculator must restore his equity to 50% within twenty-four hours or his broker will liquidate his position to pay the outstanding balance on the margin loan. This 24-hour notice is known as a margin call. To meet his margin call, he will have to deposit cash or shares of stock worth at least $6,680. Had the speculator not bought on margin, his loss would have been limited to $3,333. He would have also had the freedom to ignore the decline in market value if he believed the company was a bargain. However, his use of margin has turned his loss into $6,680 plus the commission on the forced sale of stock and the interest expense on the outstanding balance. After purchasing 1,332 shares of stock at $15, the price rises to $20. The market value of the portfolio is $26,640. The speculator sells the stock, pays back the $10,000 margin loan and pockets $6,640 before interest and the selling commission. Had he not utilized margin, this transaction would have only earned him a profit of $3,333 before commissions. The lesson is that margin amplifies the performance of a portfolio, for good or ill. It makes losses and gains greater than they would have been if the investment had been on a strict cash-only basis. The primary risks are market and time. Prices may fall even if an investment is already undervalued and/or it may take a significant amount of time for the price of a stock to advance, resulting in higher interest costs to the investor. An investor who found an undervalued stock is speculating ipso facto by using margin because he is now betting that the market will not fall far enough to force him to sell his holdings. All securities in your account are held as collateral for a margin loan, including stocks, bonds, etc. The margin maintenance requirement varies from broker to broker, stock to stock and portfolio to portfolio. The brokerage firm has the right to change this at any time so you might find yourself with a demand to immediately pay off your margin debt balance with no warning or face having your portfolio liquidated. If you fail to meet a margin call by depositing additional assets, your broker may sell off some or all of your investments until the required equity ratio is restored. It is possible to lose more money than you invest when using margin. You will be legally responsible for paying any outstanding debt you may have to your broker even if your portfolio is completely wiped out. The interest rate charged by your broker on margin balances is subject to immediate change. In some extreme cases, margin caused serious economic troubles. During the Crash of 1929 proceeding the Great Depression, maintenance requirements were only 10% of the amount of the margin loan! Brokerage firms, in other words, would loan $9 for every $1 an investor had deposited. If an investor wanted to purchase $10,000 worth of stock, he would only be required to deposit $1,000 upfront. This wasn't a problem until the market crashed, causing stock prices to collapse. When brokers made their margin calls, they found that no one could repay them since most of their customers' wealth was in the stock market. Thus, the brokers sold the stock to pay back the margin loans. This created a cycle that fed on itself until eventually prices were battered down and the entire market demolished. It also resulted in the suspension of margin trading for many years. To learn more, read our guide to trading stocks. It will explain some of the basics of stock trading, pitfalls, and much more.